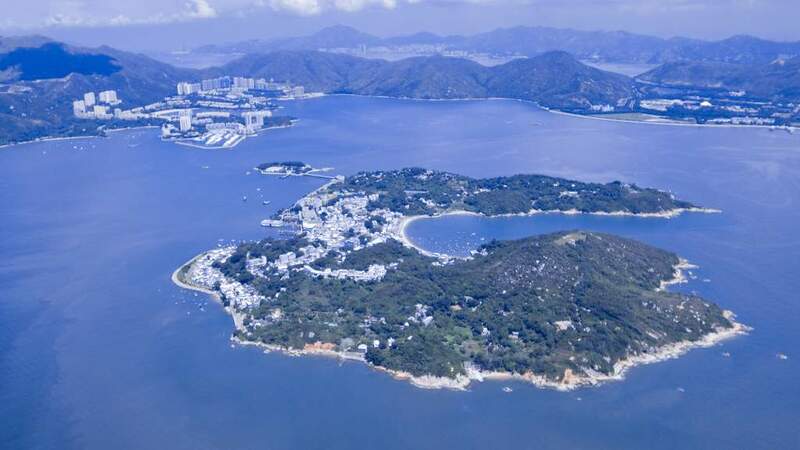 Hong Kong is known for being a crazy, energetic and vibrant destination, but we often forget that just off its shores lie over 200 beautiful islands containing a side of life far removed from the busy city streets. Most are uninhabited but many are far from it, providing a welcomed day trip or weekend away. On almost all of the outlying islands you won’t find cars, which makes for an easy escape from the tens of thousands you’re never far from in Hong Kong! Lamma is far from secluded. It’s just a 25-minute ferry ride from Hong Kong to the island’s sleepy shores, tourist-friendly shops, cafes and restaurants. The weekdays are a more relaxed time to visit but head there on a weekend and you’ll find the quiet paths leading to beautiful beaches lined with vendors selling everything from souvenirs to homemade snacks. The island offers a nice mix of residential development made up of locals and expats. Activities are easy to come by whether they be hiking in between the islands three main villages, visiting local beaches like Hung Shing Yeh or simply exploring the shops and eating plenty of fresh seafood! It’s an easy day trip so make it happen! 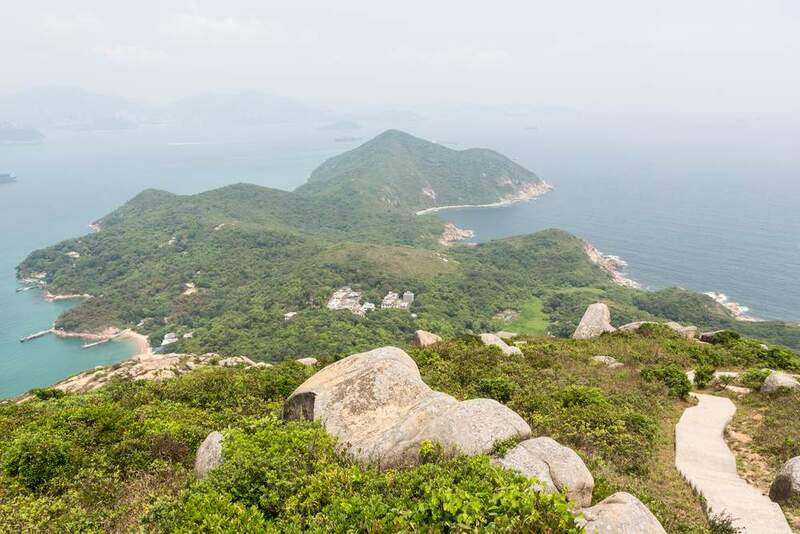 The largest of the outlying islands, Lantau is almost double the size of Hong Kong island, but its population of only 45,000 makes large portions of it feel completely deserted. With hundreds of square miles of dense forests to discover, it has earned itself the nickname “the lungs of Hong Kong” – easy to see why. It’s one of the easiest islands to visit in the area. All you have to do is fly to Hong Kong International Airport and you’re already there! Then it’s off to visit some of the many attractions. 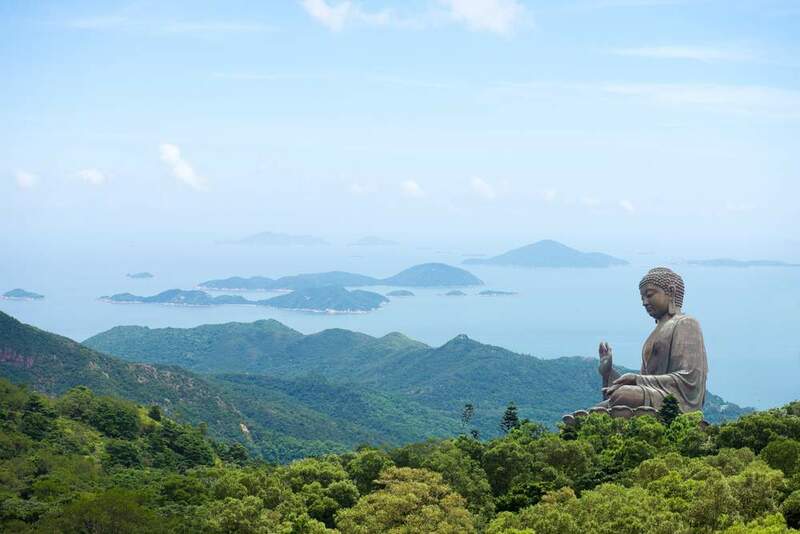 Whether it be a visit to Disneyland, long walks to towering buddhas, or some relaxation on a long, sandy beach, Lantau certainly comes with its fair share of entertainment and natural beauty that you’ll want to experience. Stunning scenery like this will make you feel as if the Hong Kong pace of life is a world away. 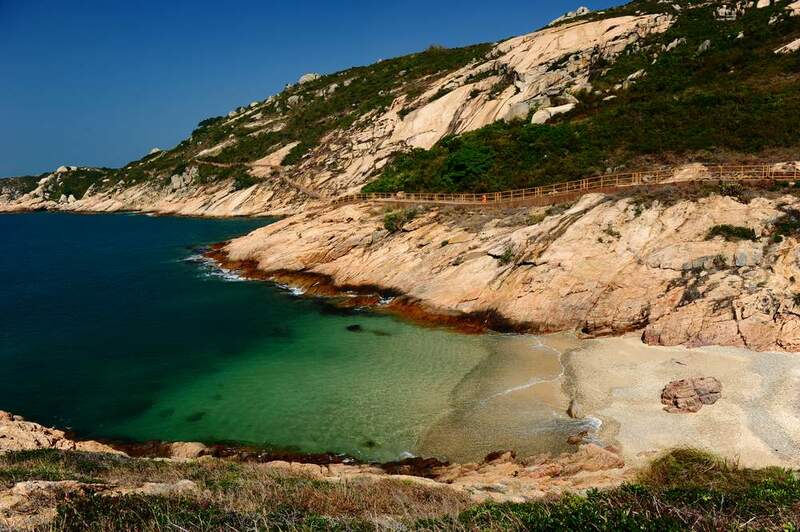 It’s an hour-long ferry ride from Zhonghuan Wharf to the once pirate-inhabited island of Cheung Chau where beaches like this secluded one await. The island is also a popular retreat for water sport enthusiasts and wind surfing is particularly popular at Kwan-yin Wan Beach. 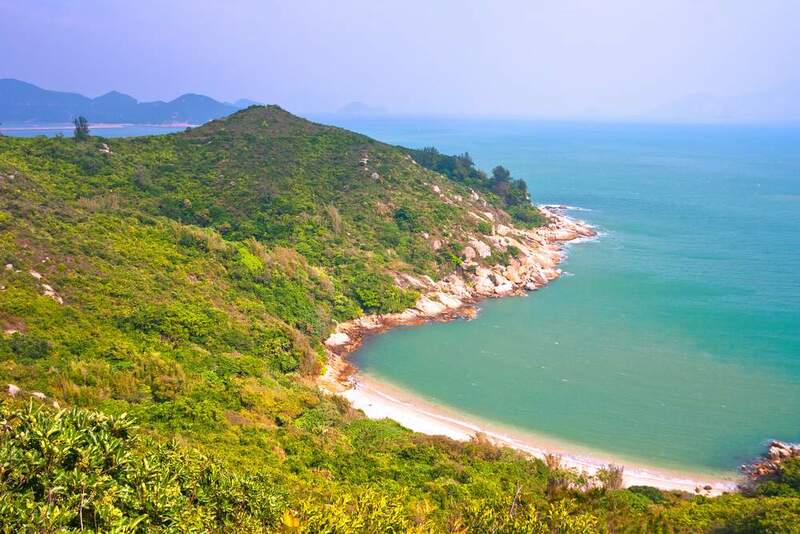 Aside from the general tourist activities of eating and drinking, Cheung Chau has a few particularly unique attractions to visit. For the best views of the island head up to the Beitiao Pavilion, located at the highest peak and just a short walk from the ferry port. Or, if you’re more interested in the pirate folklore then Cheung Po Tsai Cave on the island’s southern tip is rumoured to be the location where the pirate for whom the cave is named hid his treasure. Who knows, maybe if you bring a flashlight you might find some! Compared to some of the other outlying islands, Peng Chau is fairly quiet and for most of the year you won’t find many people here. But if you’re looking for a piece of solitude then this is just the place for you! The area surrouding the port is the only real development on the island and you will discover that there are many charms to be discovered here with a walk on the Peng Chau Heritage Trail. Venture out beyond the port and you’ll find pleasant stretches of uncrowded beach and modest hikes to stunning viewpoints. The most popular is Finger Hill, the island’s tallest point, which is a great place to enjoy views of all that surrounds you! Po Toi is not the beachy getaway that most people are after when they escape Hong Kong, but many venture to this largely uninhabited island for its beautiful rock formations and wonderful hiking trails, which are well sign posted and very accommodating for most levels of fitness. On top of that, because there aren’t a lot of visual obstructions, views are excellent all over the place. On a sunny day its a great way to enjoy the weather and get outside. Ferries aren’t as frequent as some of the other neighbouring islands but still come and go often enough to make a nice day trip. Seafood is always a given but especially here where you’ll find some excellent octopus for those who dare! Find cheap flights to Hong Kong! Search cheap holidays to Hong Kong!